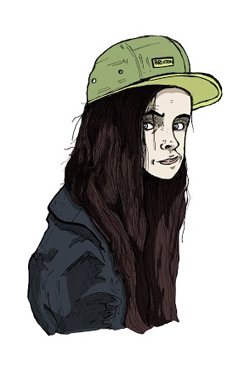 One of our 2017 Broken Frontier ‘Six Small Press Creators to Watch‘, Olivia Sullivan (aka Zen Bucko) first came to prominence on the UK small press scene – as so many new creators have over the last couple of years – in the pages of anthology Dirty Rotten Comics. 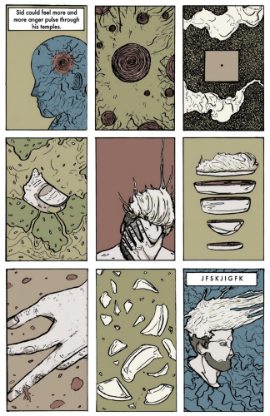 Her work has been engagingly experimental, with a focus on autobio and the peripheries of graphic medicine. ANDY OLIVER: Before we talk about your comics work could you tell us about your artistic background and your wider practice? OLIVIA SULLIVAN: In regard to my wider practice and background, I am currently in my final year at the Royal College of Art. My practice is largely experimental and involves outcomes such as installation and moving image. Drawing is still the main focus of my work, but my experience at RCA has given me the confidence to challenge definitions and think more laterally. What is it about comics that made it the ideal medium for your work? And what were your earliest comics inspirations? I’ve always been focused on abstract storytelling and illustrating. I think most comic formats can be too rigid and limiting, so I have always approached it the way I preferred. Comics are ideal because I don’t have to be as sequential as in animation, I can use words or decide not to. But, I get the feeling that not many people have fully embraced experimental comics and are stuck in tradition. My earliest inspirations are The Beano and The Dandy. My favourites were strips from The Bash Street Kids. I got the Annuals as a kid and would read them so much that they’d detach from the spine. I have a large collection of anything to do with The Beano and The Dandy. It reminds me of the freedom of being a kid, now I am too precious with creating things and how others will perceive it. I have always appreciated Batman, but generally I am put off by superhero comics. There are many people involved in making those comics, it has a factory mentality, the plots are relatively dull and a little bit soulless. I also don’t like the smell of gloss. 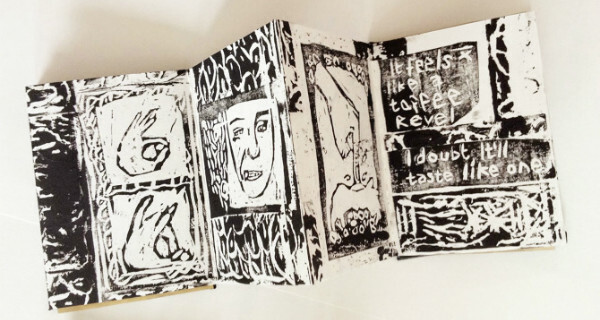 From the tactile linocut zine Exponential Growth (above) to the newspaper format of your Nikolai Gogol adaptation in The Nose: Uncovered and Annotated (below), your early work has an experimental feel in terms of the formats used and the constantly shifting presentational approaches. 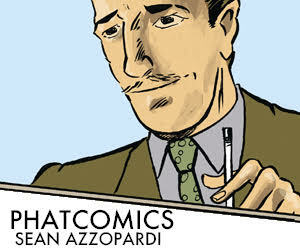 Was that a conscious decision initially to explore the possibilities of the form and discover your comics voice? I think format can be overlooked in comics, because mainstream comics have this particular look and feel to them, and books for the most part have the same components. To me, comics do not necessarily belong in books, which is what my interest is in at the moment – getting out of the format entirely and seeing how it can work. So, it is definitely a conscious decision now, but with my prior comics it was a little more incidental. But I still considered how the format reflects the content of the narrative. I think I’m closer to finding my voice now, but with new information and inspiration on a daily basis I always want to improve and try new things. 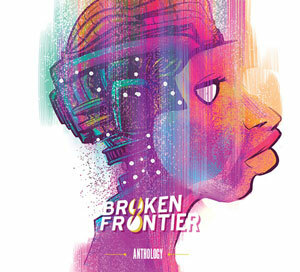 Many readers will have discovered your work through the accessible collaborative anthology Dirty Rotten Comics. How important was your involvement with DRC both as a profile building exercise and also in establishing a supportive network of peers? I am very grateful to DRC in giving me a platform that I would not have otherwise. It was a fluke that I found calls for submissions. I wanted to get my work out there, I was just so nervous and insecure about my work and still am to an extent. Luckily, I am getting a thicker skin with things and realise that the risk is always good, even if you fail – you learn from it. The question, ‘If no one sees your work, does it really exist?’ Is always on my mind. The fact that DRC facilitates stories that are quite different and dark at times… I think that helped me realise that there is a place for my work. They are fantastic guys at DRC and deserve so much praise for what they are doing for emerging artists. While a lot of your work has an autobiographical slant you have self-published some very diverse material. What was the impetus a year or two back to adapt a Nikolai Gogol story in The Nose? The Nose was created as part of a project from my studies at Camberwell. I was set to illustrate a novel from a reading list. I focused on a sub-narrative to make the story my own rather than just a re-telling , this interest of sub-narratives led to my DRC ‘Brave New World’ comic. The list of books to choose from was The Nose, and it is now one of my all-time favourite stories. The peculiar and almost nonsensical tale of this high society man in St. Petersburg losing his nose and then his status to his nose was such a creative way to critique the social and political climate at that time. 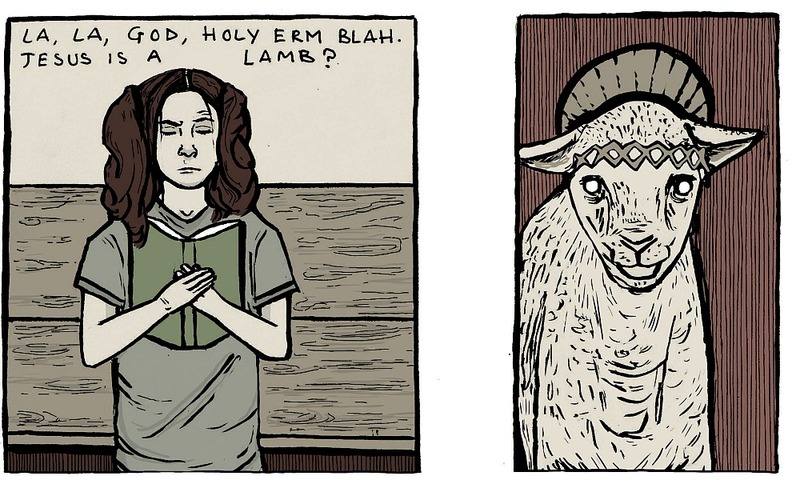 I Drank Holy Water (reviewed here at BF – images above and below) with its reflections on your childhood relationship with religion, was, arguably, the work that first brought you to a wider small press audience. Was it at all a daunting proposition putting such uncompromisingly personal material out there? 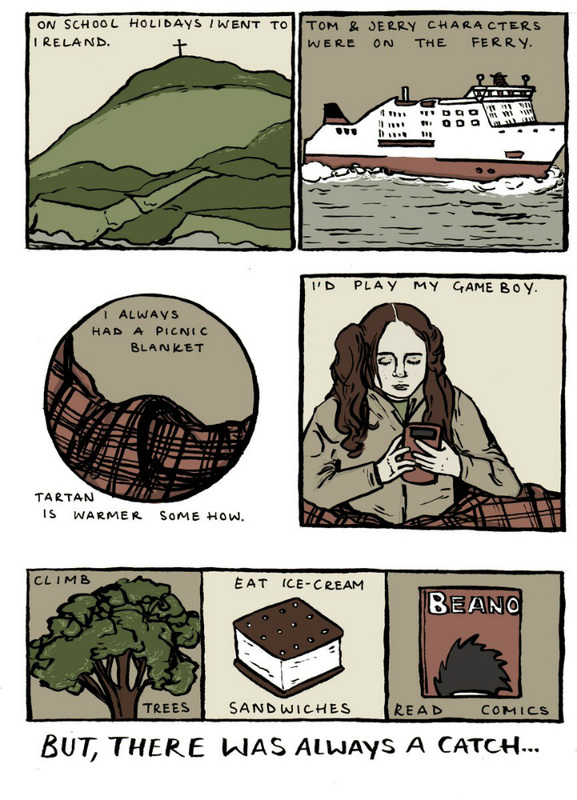 And are there particular responsibilities when tackling autobio themes? 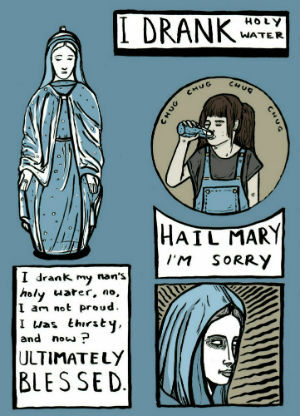 I Drank Holy Water came from an exercise I did for my final year at Camberwell. 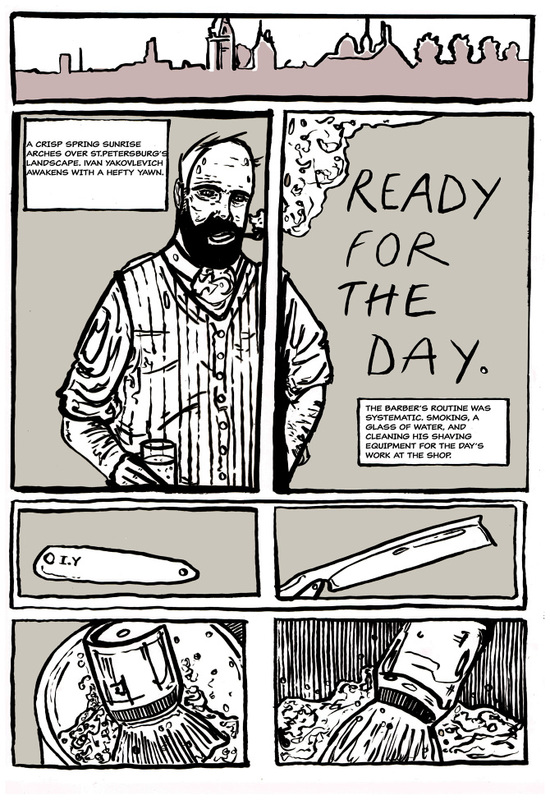 I created so much material from making a comic/drawing a day for a month, I did not know what to develop. 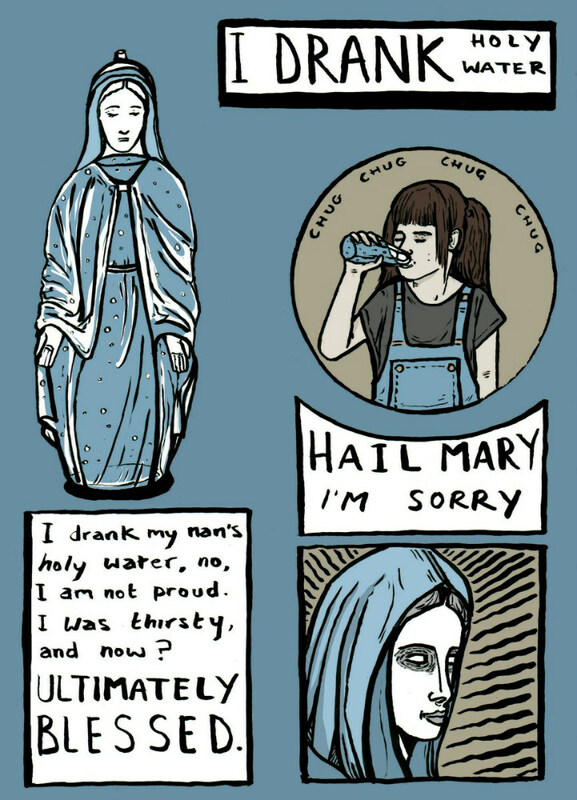 I started with a drawing of myself drinking holy water as a prominent memory that I had, and that drawing then started the whole process of the story. It was daunting, but I was not the only person I knew creating revealing personal work at that time, so that really made the whole process more normal. I feel it is a bit of a grey area when it comes to responsibilities, in all spheres of creativity. In autobiographical work, as long as you have your truth, make people aware if they are being represented in the work and if they are okay with that, it should be morally sound. However, if a religious family member gets a hold of your book let’s say… it may not go down too well if you made a book like I Drank Holy Water. But, you can’t control people’s reactions to things, especially when faced with truth. 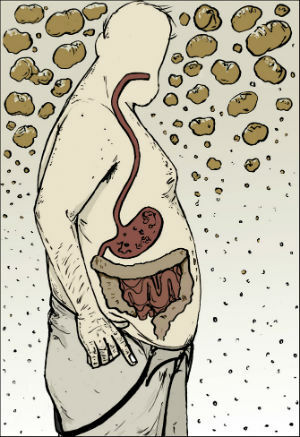 There is always a line – much like with comedy, I think you have to go with your gut when placing the line. I made I Drank Holy Water as well as SID for a particular type of person where the line is much further away. You recently returned to the pages of Dirty Rotten Comics for their colour tenth anniversary issue (below). Was that an opportunity to reflect on how far your practice has grown and evolved since they first published you a few years back? My most recent DRC was a good opportunity to present where I am with my comics now. I was thinking of little skits in my head with the earlier strips in DRC, but now I am taking things more seriously. I want to present quality rather than quantity, and try to not just mindlessly add to the visual saturation. 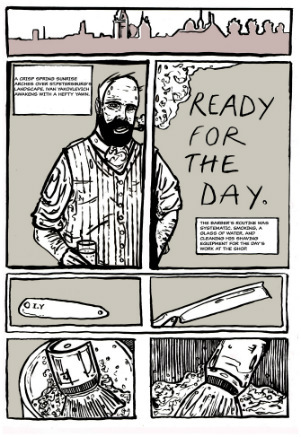 The anniversary strip was made as part of a science fiction installation in an underground car park. Therefore, that story was made with the intention to be developed outside of print. 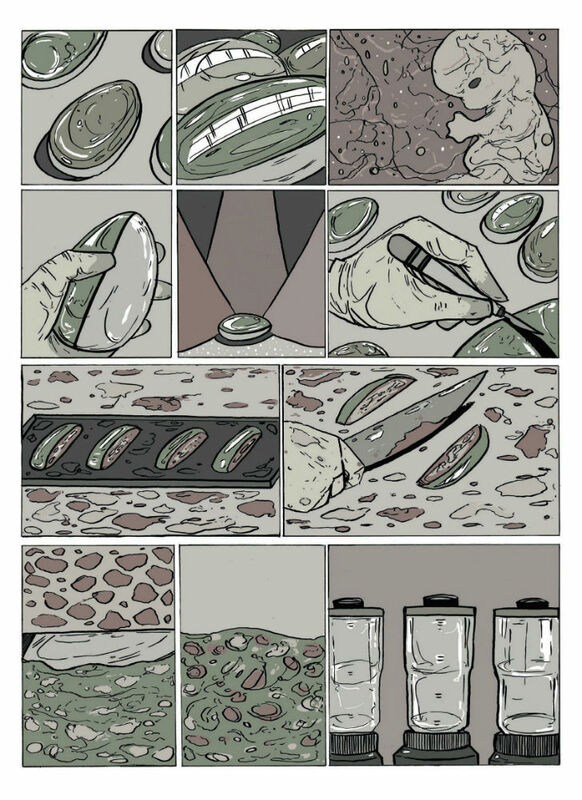 I prefer silent comics over written text at the moment as it gives more authority to reader, with comics there is the issue with words and text being present simultaneously – it can dictate one representation and limits the reader’s imagination. I want to balance it out. Your most recent comic is the critically acclaimed SID. 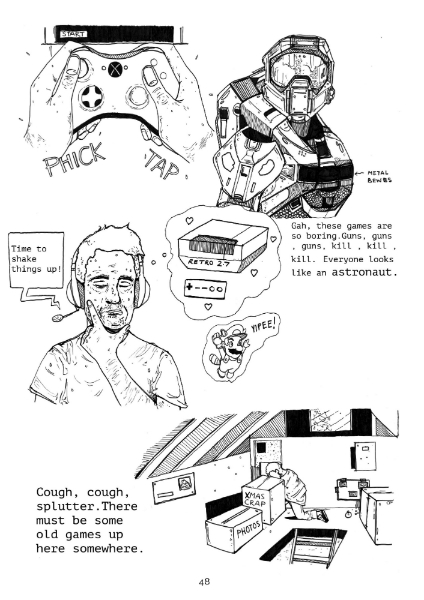 How did it end up with micropublisher Good Comics? I think it started when I was asking creators on social media how long a graphic novel should be. Sam Williams was interested that I was planning to create new work and we spoke from there about the possibility of it being published by Good Comics. I was given free rein to make the book that I wanted, and to give me free rein is a brave thing to do. 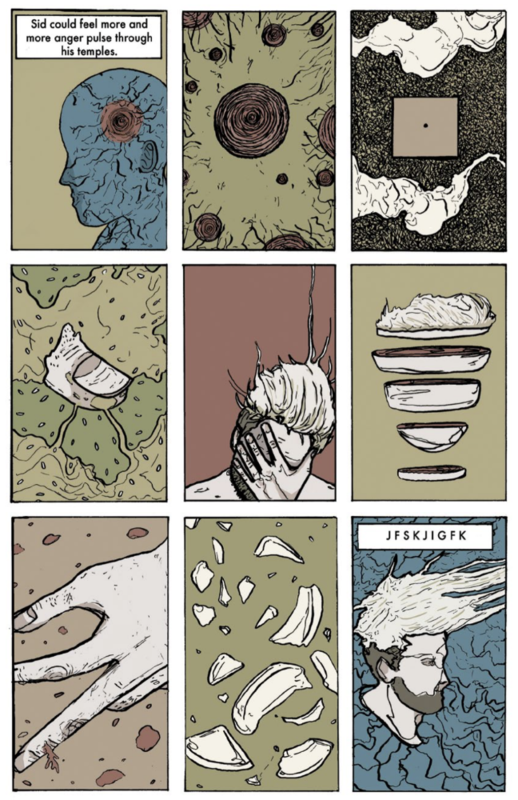 SID further examines ideas of obsession and compulsion through the fractured mindscape of its titular protagonist in one of the most original uses of the graphic medicine strand of comics I’ve ever read. 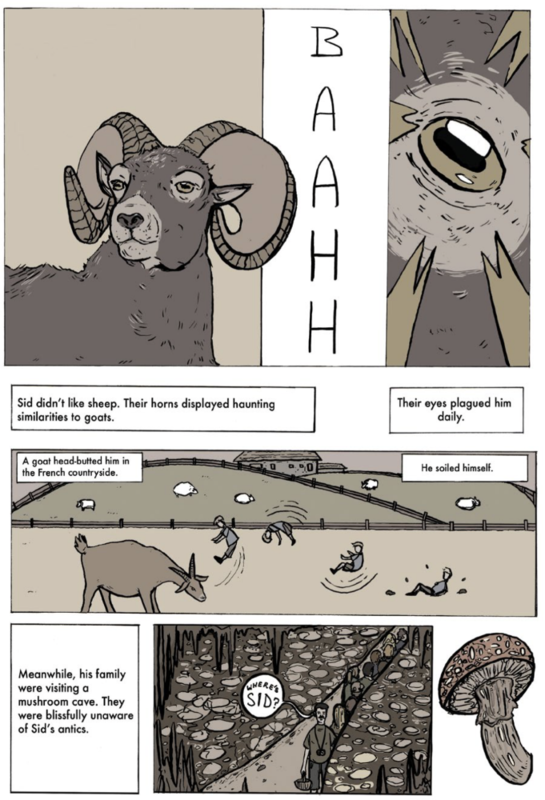 Can you tell us a little about how you went about using the pure visual language of comics to communicate the character’s state of mind in a way that no other medium could have achieved? SID was my first full story that I wrote when I was around 17/18. It was uncensored and had little context – if I ever made that version it probably would be unreadable. I am inspired by film and animation more than anything, work from David Lynch, Lars von Trier and animators such as Jan Svankmajer and David Firth reaffirmed that I can experiment and be true to what I want to make – even if it alienates some, that is fine, they don’t have to watch/read it. I like the mix of surrealism and comedy as both seem to be more of a representation of what reality really is – nonsense. Framing and shots in film are not dissimilar to that in comics, and I wanted to have cluttered panels to reflect the cluttered story. It is meant to be jarring – because the character’s perspective is. Film achieves making the audience feel what the character is feeling. But, with comics you are able to take more time to process a feeling, from a panel to an entire page of visual material. I wanted to do that with SID. 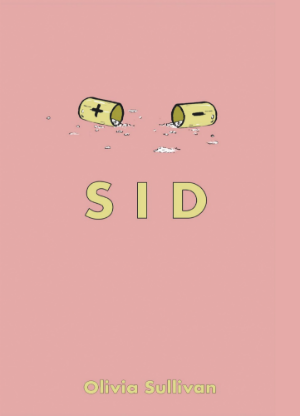 In SID (below) as in some of your other comics you’re never afraid to make the reader work a little harder in taking meaning from your narratives and finding their own truths within them. Do you think that approach fosters a more intimate relationship between reader and page? I would like to think so. I do think it is important. I am glad it has reached people that understand it or have at least made a meaning for themselves. It was a book I wanted to make even if it was just to appease myself. With some freedom misinterpretation is expected, and it can be frustrating. I enjoy experimenting, but I am not purposefully trying to be alienating to the mainstream. If I was, I would not have censored it. SID was partially inspired by Plato’s Cave allegory. SID is seeing glimpses of real truth through visions of The Blue Lagoon and The Forest, the cave is his given ‘reality’ which has deemed him unstable for things that are totally worthy of being driven crazy about: meaning, social status, routine etc. That is essentially fiction, human constructs are insignificant. So, SID is for those outside the cave who want to explore things other than what they are usually presented with, which in this case is the optimism of nihilism. SID is a mash-up of sincerity and satire. Some parts are really making fun out of things that I think some people have missed. I wanted to also comment on the issue of victimhood with some people self-diagnosing or wearing it like a fashion statement, it is weird and damaging. The title SID is to reflect the multitude of acronyms people have or think they have. Sid’s mental state is due to him not wanting to accept the reality of the world, he is made to feel miserable and unhinged on the foundation of fiction – I don’t think he is mentally ill, he’s made to think he is abnormal when he is totally sound. The use of language in your work is of especial note. There’s an often raw poetic rhythm to it that perfectly complements the intensity of your visuals. With that in mind can you elaborate on your creative process? Is that evocative dialogue/narration inspired by your imagery, for example, or vice versa? I start most comics with either a rough script, abstract writing/poetry, or just some random words. I am also influenced by spoken-word, in particular Henry Rollins and Ivor Cutler, and music from the likes of Tool, R.E.M, Eminem and Kendrick Lamar. Words can inform the images and the images can inform the words. It is all images and mind junk that I enjoy mixing. And, finally, what are you working on next in comics? Are there any hints you can give us as to your next offering? I will be working on my final project at RCA where I plan to use comics in various ways, more so in moving image, but also through model making and installation. For my next comic in print format, I want to concentrate on more illustrative aspects of my work and it will most probably be a silent comic or have very limited text. For more on the work of Olivia Sullivan visit her website here and follow her on Twitter here. 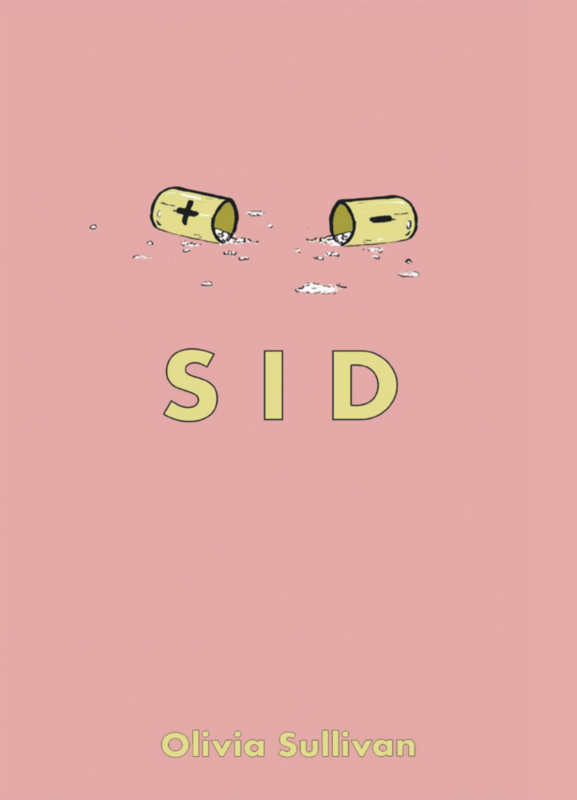 You can pre-order SID from the Good Comics store here. 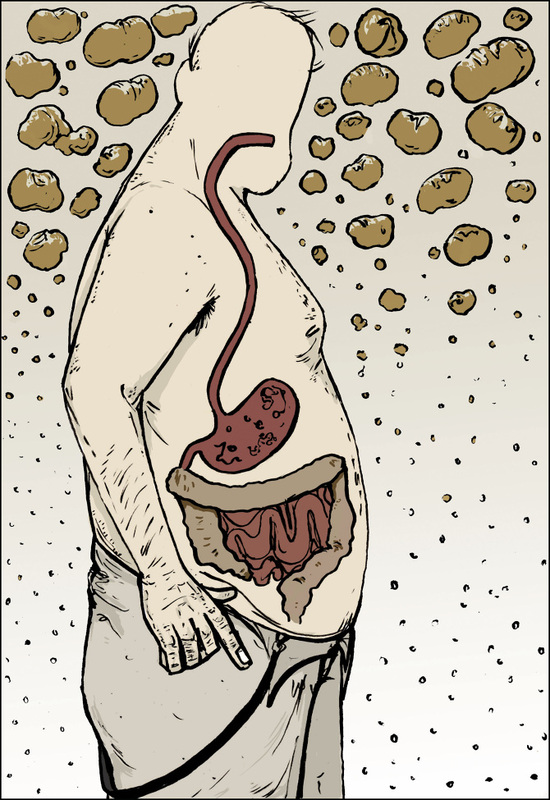 You can also buy issues of Dirty Rotten Comics here.